When you accidentally delete an email message in Outlook on the web you can recover the message if it's still in your Deleted Items folder. In some cases, you can even recover items after the Deleted Items folder is emptied. You can also recover a deleted folder (with all of its messages) if it's still in your Deleted Items folder. Unfortunately, you can't recover a folder that's been permanently deleted. But you can use the steps in this topic to recover messages that were in a folder when it was permanently deleted. When you delete an email message, a contact, a calendar item, or a task, it's moved to the Deleted Items folder. If you don't see a message in the Deleted Items folder, check the Junk Email folder. Contents of deleted folders are only visible once you expand the Deleted Items folder. Deleted Items folder: Select the message you want to recover, and select Restore. 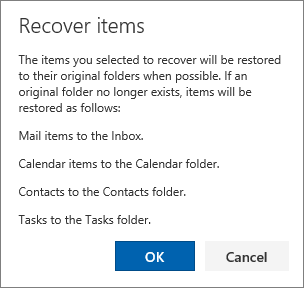 To restore a message to its original folder, right-click the item and then select Recover. To restore a message to a different folder, right-click the item, and select Move > Move to a different folder. Next, specify a folder location, and then select Move. Tip: If you delete a folder, it's moved to the Deleted Items folder and appears as a subfolder. To recover it (and all the items it contains), right-click the deleted folder, click Move, and then select a folder to move it to. 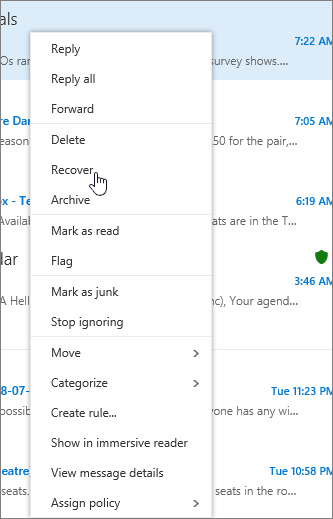 In the left pane of the Outlook on the web window, select the Deleted Items folder. At the bottom of the window, select Recover deleted items. or from the Reading pane. In Recover items, select OK. Note: You also can delete items that are shown in the Recover deleted items dialog box. Select the item, and then select Delete. If you delete an item, you can't use Recover deleted items to get it back. When you delete a message, it’s first moved to the Deleted Items folder. 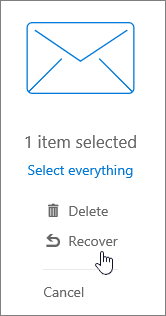 You can let messages stay there until you remove them or you can set Outlook on the web to automatically empty your Deleted Items folder each time you sign out. Select Settings > Mail > Options, which opens the Options panel on the left. Under Mail, select Message options. Select the Empty the Deleted Items folder when I sign out check box, and then select Save. Note: If you're not sure which version of Outlook you're using, see: What version of Outlook do I have?